Lake Robertson is a 31-acre impoundment tucked in the mountainous terrain of western Rockbridge County. The lake was constructed in 1971 and appropriately named in honor of an ardent sportsman, Senator A. Willis Robertson. Lake Robertson is the focal point for a 581 acre tract of agency land, most of which is managed for hunting. Approximately 75 acres are leased to Rockbridge County to operate a park and recreation facility around the lake. Lake Robertson is a crystal clear lake with an average depth of 18 feet. The lake’s clarity poses some challenges for fishermen. Trophy largemouth bass are frequently seen cruising the shallows in spring and fall, but warily swim off when approached by anglers. The clear water also allows for sunlight penetration, encouraging the growth of curleyleaf pondweed and elodea. Sterile grass carp have been stocked to help control water weeds. 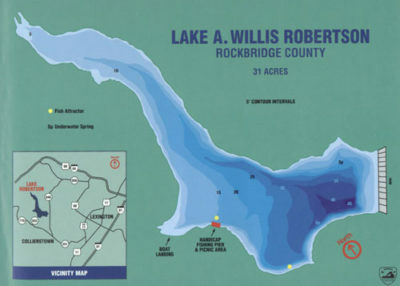 Old roadbeds, house foundations, and springs are located on the lake’s bottom, so anglers who have done their homework will easily locate fish. This video is not playable in your browser. From I-81, take I-64 for one mile. Take exit 55, then Route 11 South to Lexington. Exit left to the Route 11 South Bypass and go to the first stoplight. Proceed straight onto Route 251 and follow brown directional signs to the lake (14 miles). For the angler looking for plenty of largemouth bass action in western Virginia, Lake Robertson is the place to go. Bass are abundant and several have been caught over 10 pounds. Early spring moves large females in shore, in search of food after a long winter. Beaver lodges and introduced cedar tree and hinge tree attractors are good holding areas for quality largemouths. During May and June, the edge of massive weed beds are a sure bet, especially around dusk. Surface action can be tough at times, so deep diving artificials and live bait can produce some quality fishing. Channel catfish were not a major component of the fishery at Lake Robertson prior to 1993. At that time, large catfish were introduced at a reduced stocking rate, and that proved to be the key to their current success. The thinking was that the largemouth bass population was so dominant in the lake that the fingerling catfish were being consumed before they were recruited to the fishery. Stocking 10 – 12 inch cats eliminated immediate predation by young bass, giving them an opportunity to grow into their new environment. The result is a healthy population of channel catfish in the 15 – 30 inch size range. Many catfish are caught from the bank at Lake Robertson on nightcrawlers, minnows, and chicken livers. Several species of panfish are present in Lake Robertson. Bluegill are abundant and the population is well structured with good numbers of 6 – 8 inch fish. Look for big gills near beaver lodges and brush structures in early spring. Redear sunfish, also known as shellcrackers, were once very prevalent. Their numbers have declined in recent years, so they were recently stocked to give them a presence in the lake once again. Redear’s are popular because they are often caught in excess of one pound. Pumpkinseed, redbreast sunfish, and warmouths also populate the clear waters of Lake Robertson, however their size is small and their numbers are few. This member of the perch family is a very popular sportfish in the upper Midwest because of its size and flavor. Walleye were thought to do well in Lake Robertson because of it’s clear waters and ample forage, so they were first stocked in 1983. Walleye, stocked as fingerlings, grow well here and have attained sizes up to 7 pounds. Their population is small, but ample numbers of quality size fish are present to create some diversity to fishing stringers. Walleye, best caught at night or on cloudy days, can be caught with bright jigs around wood structure or rip-rap. Five channel catfish over 20 inches in length may be creeled daily. 25 of any panfish species in aggregate (no size limit) may be creeled daily. Five walleye over 20 inches may be creeled daily. A concrete boat launch is available. A handicap fishing pier, a courtesy dock and fish cleaning station were constructed for angler convenience. A concession stand handles boat rentals, campground registration, and fish bait. A 53 site campground is available seasonally. A swimming pool, tennis court, softball field, a playground, hiking trails, and a group picnic shelter are conveniently located next to the lake. Fish habitat manipulation is a common tool used by biologists to improve fishing. At Lake Robertson, aquatic weed control is very important. Too many weeds impede fishing and too few weeds expose young fish populations to overpredation. Triploid grass carp have been stocked periodically to help control weeds. Fertilization was tried through the 1980’s and was somewhat successful. In the future, biologists will spot treat nuisance water weeds with chemicals in order to maintain a balance of weeds and fishing space. One of the main water weeds, curleyleaf pondweed, comes on strong in May, but usually dies back by mid-June. Winter drawdown of the lake also helps control water weeds. Also, as far as other fish habitat improvement goes, red cedars have been cut locally and sunk in piles at different locations around the lake. Culled evergreens from a Christmas tree operation have been deployed as well. These tree shelters attract baitfish, and hence larger fish for anglers to target. Biologists have also dropped hardwood trees from the bank into the lake with chainsaws. These “hinge trees” create a great deal of structure with both the crown and the trunk. Another fish manager’s tool, stocking, has been employed frequently at Lake Robertson. In order to maintain good stocks of channel catfish and walleye, both species must be stocked annually. Adult channel catfish are usually stocked in the fall and fingerling walleye are released in the spring. Walleye stocking was recently increased in order to bolster future adult stocks of this great game fish. Also, as mentioned previously, redear sunfish were stocked in 2001.